T.S. Eliot famously wrote, “April is the cruelest month.” And though the phrase is often misinterpreted to mean that spring comes too slowly and April is too rainy and cold, in fact it refers instead to the fact that April brings life and new hope and spring. Those who dwell in Eliot’s wasteland don’t want to be woken from their numb, cold slumber. But for artists everywhere, spring is a welcome symbol of new life and inspiration in the form of awakened desire and memory. 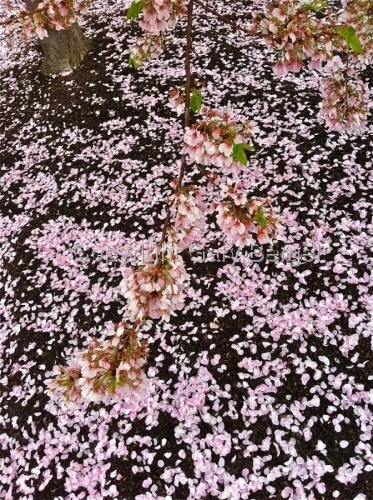 Spring is coming slowly to the Eastern seaboard, after a long, harsh winter. Sunny days are cold and bleak, and warm days see pouring-down rain. And yet there’s something hopeful in the slant of the light and the singing of the birds. Spring will come whether we’re ready for it or not, and bring us all to life. Of course the beauty of art is that even in the most reluctant spring, even in the depths of the coldest winter, you can have spring on your walls. In a variety of media Artspan artists explore the possibility of abstracting and capturing the essential vitality and color of spring. 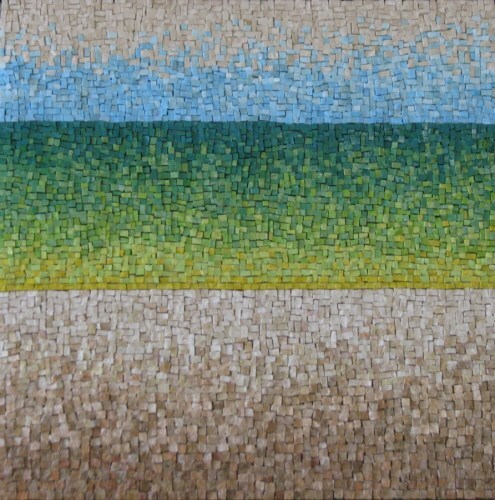 Terri Borges uses mosaic tiles of smalti glass and marble to create a vibrant picture of spring-green life rising to a clear sky. Borges uses traditional mosaic techniques to “try to capture the essence of natural subjects and abstract concepts to create a unique artistic and textural interpretation.” Through texture and color, Borges makes an unmistakable portrait of the jumping life of a spring day. Barbara Fields Timm investigates the “form of natural processes, seen and unseen, such as the feel of a rainy day, the flight path of active hunting insects, and the swelling calls of spring peepers.” Timm’s work explores “…regeneration in nature (in a time of destruction) and my desire to experience magic and wonder in daily life.” In her triptych Spring Calling Frogs, she moves from winter to spring, and she actually visualizes the calling of spring frogs. 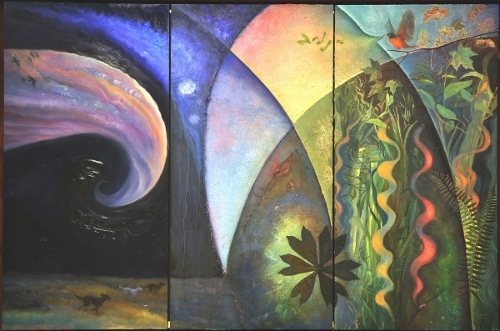 The painting is lively and leaping, and it races from dramatic swirling darkness to brightness and life, from a sparse black sky to abundance. 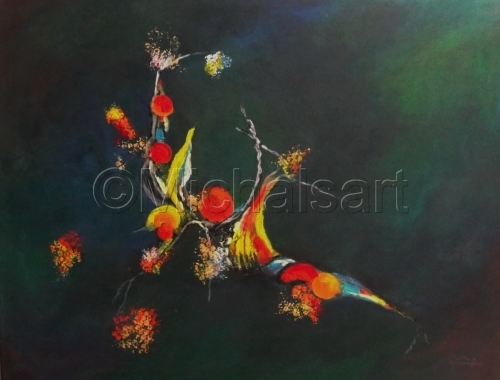 Michal Ashkenasi’s Spring Explosion is an abstract vision of the “explosion” of flowers and new foliage in spring. We sense the greenness of the very air, the vividness of flowers and birds, and the whole painting jumps with exuberance and hopefulness. Ashkenasi’s work is the result of imagination and nature. The minimalist abstract-figurative style combines strong colors and contrasts to arrive at a harmonic oneness, just as the changing seasons of the year stir us with newness, and then settle into all of the variations that we expect. Marie Kaplan describes the creative urge as falling in love, and what better time for that than spring? She says that to create is “…to see greatness in the everyday. Nature inspires, so does graffiti. Any shape—organic, geometric—can make for great art. Even the most misshapen object exudes a certain beauty in the right context. What artist doesn’t know the joy of transforming the ordinary to the poetic? 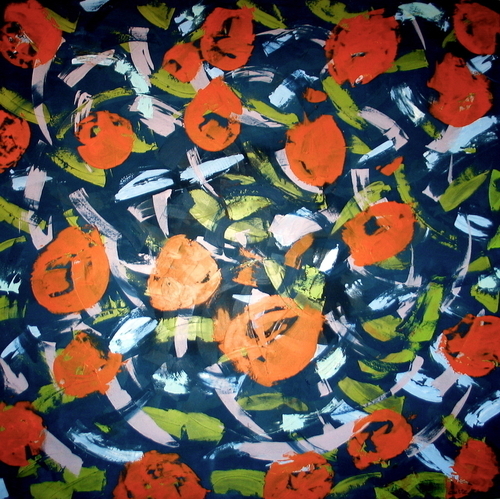 And the feeling of power that comes with it?” In Spring, she creates a lively, whirling swirl of bright colors and flower-shapes, inviting us into the excitement of a spring day. The world outside is slow to come to life this year, but the vitality of inspiration and creativity knows no bounds.